The flag of Scotland is a white saltire on a blue field. In heraldic language, it may be blazoned azure, a saltire argent. 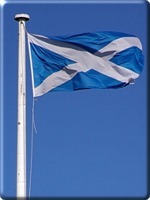 It is named the Saltire or Saint Andrew's Cross. The Saltire, an X-shaped cross, represents the cross of the Christian martyr St. Andrew, patron saint of Scotland. In 732 A.D., King Angus MacFergus II, High King of Alba, and Eochaidh, King of Dal Raita, led a combined force of Picts and Scots to battle against the Angle army of King Athelstan of East Anglia near present-day Athelstaneford in East Lothian. As the enemy surrounded the camp of the Picts and Scots, King Angus prayed for deliverance from the heathen forces. During the night before battle, Saint Andrew appeared to the king in a vision and promised that Christianity would triumph. On the field of battle the next morning, a saltire of white clouds appeared against the clear blue sky. This image reinvigorated the spirits of the Picts and Scots, while the Angles, disheartened, began to falter. After Athelstan was killed, the Angles fled, leaving the Picts and Scots to celebrate victory under St. Andrew's Cross. The earliest record of the Saltire dates from 1165 A.D. in reference to the ninth century battle, and it was being used as the national emblem of Scotland on royal seals by the thirteenth century. The Parliament of Scotland decreed in 1385, moreover, that Soldiers should wear the saltire as a distinguishing mark. The earliest surviving Scottish flag consisting solely of a saltire dates from 1503, and depicts a white cross on a red background. By the end of the century, the blue background was set in reference to the legend, giving Scotland its national flag as it appears in its present form. 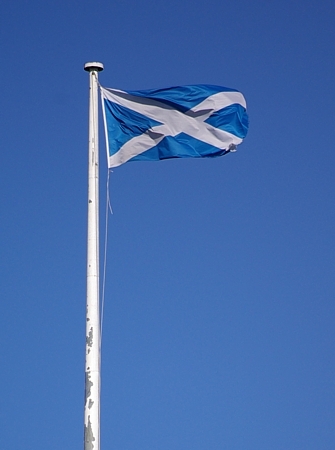 The Saltire flies on all Scottish Government buildings every day from 8:00 A.M. until sunset, except on national days, when it is replaced with the Union Flag. The flag of Nova Scotia features an inverse Scottish Saltire (blue on a white field) combined with the shield from the Royal Arms of the Kingdom of Scotland, signifying its heritage as the Kingdom of Scotland's first colonial venture into the Americas.